In celebration of National Ice Cream month and National Hot Dog month, the Wienerschnitzel here in Carson City is giving away free food this afternoon. 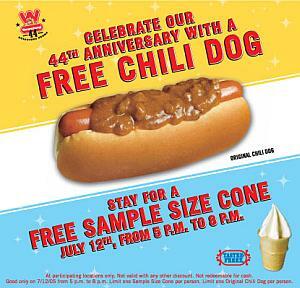 If you come in today, July 12th, 2005, between 5pm and 8pm, you can get a free chili dog and a free Tastee Freez ice cream cone. So if you’re going to be on the east side of town (Wienerschnitzel is out Highway 50 East, past the Alberston’s shopping center), stop on by. It’s not the best chili dog you can get, but for three hours it’s the cheapest! Next What Will Become of Wendy's?